New Delhi, February 11: “The way that the security is modernized by the Security Printing & Minting Corporation of India Limited, is a matter of happiness and pride and that participation of all is of crucial importance in this kind of success”, said the acting Finance minister Piyush Goyal while addressing a sea of people at the 13th foundation day of SPMCIL in the national capital on Sunday. “We Indians need not compress our needs on any platform, whatever is modern and novel in the world, should form part of the nation as a whole. On the contrary we need to channelize our thoughts to the progress. If we keep adhering to the old thinking line, the nation may not monitor progress and growth”, he added further. 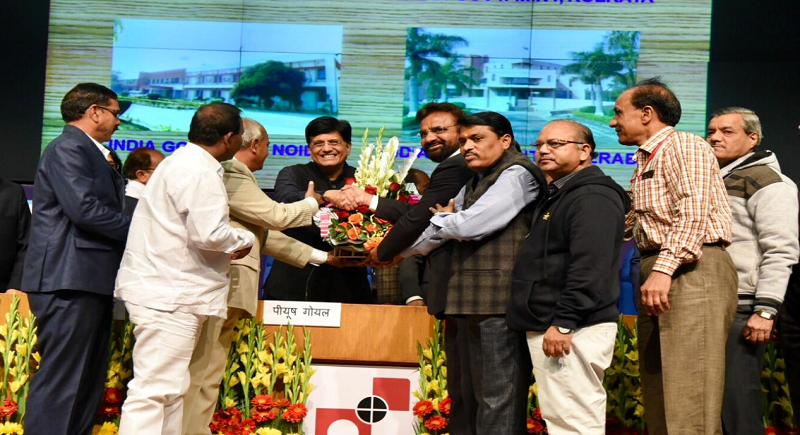 Goyal asked state-owned Security Printing & Minting Corporation of India (SPMCIL) to tap its full potential and expand export footprint so that profit can grow exponentially. "I am told that the company has already initiated talks with some countries for minting of coins and you have potential to export to African countries and European nations”, he said meanwhile. The company should have huge outreach programme and try to get big orders in the area of minting of coins, printing of currency notes and postal stamp, dreaming big and think of achieving profit of Rs 6,000 crore. The company should also focus on modernisation of its nine production units across the country so that it can get export order, Goyal added. Stressing at the economic development in the nation, the minister said that Atal Bihari Vajpayee launched the act of Fiscal Responsibility and Budget Management for the betterment of the Indian economy. Never in the LED, had anyone imagined that India was the leader of world, aiming to close unmanned gates in the railways”, he added lauding the progress made by NDA government. Meanwhile speaking on the occasion, Economic Affairs Secretary Subhash Chandra Garg said that the company has become self sufficient in currency paper and one more mill that is proposed in Hoshangabad, will take care of needs of currency paper requirement of RBI printing press as well. Garg also informed that the new series of coins have been designed and remarkable feature of this series is that they are friendly to visually handicapped people.